After finishing my summer travels in Amsterdam, I hopped on a train to Paris for what was going to be an unforgettable 48 hours. We arrived in Paris at midnight and knocked out shortly after. But to be honest, I had a lot of trouble falling asleep — I couldn’t believe I was actually in Paris! 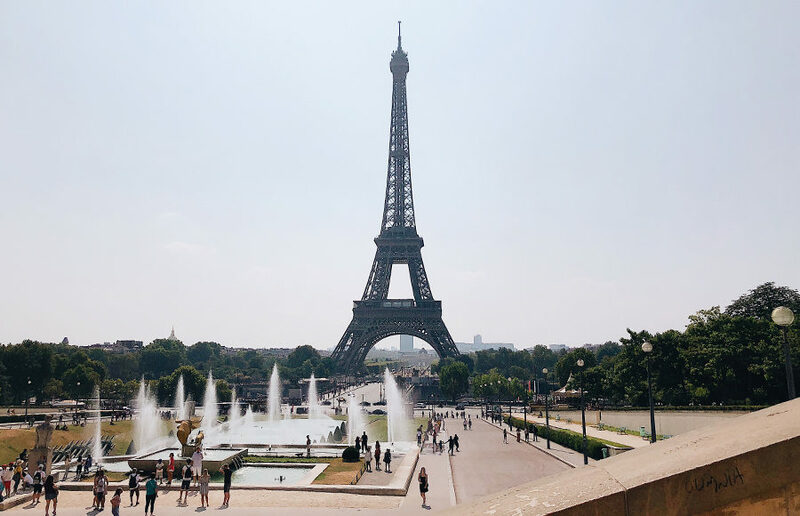 It might sound a little cliché, but traveling to Paris had been a dream of mine. I had been studying French for more than four years, and it was finally time for me to put my knowledge to the test. Because I’d dreamed of visiting this city for years, there was a lot that I wanted to do during my short stay in Paris. Commençons! 6:00 a.m. — Bonjour, Paris! Our first order of business was to figure out the public transportation system. The train stations in the city allowed us to buy tickets that could basically be used on anything: the bus, train, tram — you name it. With a pack of 10 tickets, we made our way to the Louvre via bus at 7:00 a.m. Why so early? The answer is simple — to avoid all the photo-bombers! Nothing is worse than having people photo-bomb your super Insta-worthy photo. There was something so serene and beautiful about the early-morning streets of Paris. Now, the Louvre was even prettier in person. The architecture of the building and the iconic glass pyramids were breathtaking. I mean, if it looked this good on the outside, just imagine what it looked like on the inside. After our touristy photos at the Louvre, we headed over to Eric Kayser for a croissant and latte before our scheduled slot at the Louvre. 9:00 a.m. — Louvre-ing it up in Paris! For starters, I love art museums, so the Louvre was a serious treat. Because our slot was the first of the day, we got to see the “Mona Lisa” with literally no one in front of it. For the next couple of hours, we roamed every floor and corner of the Louvre — not a piece of art was missed by our eyes. You better believe I was living my best life galavanting through the Louvre with the clicking of my mules on the floors of the museum. I was the literal definition of a happy camper. After spending the morning at the Louvre, we left for another famous Parisian landmark: the Eiffel Tower! Just a short bus ride away, the tower greeted us with its tall metal structure and the large herd of people that surrounded it. After admiring the beauty of this iconic structure, we decided to head over to Rue Montorgueil, a trendy neighborhood with lots of shops and restaurants. After walking around and looking at all of our lunch options, we chose a café on the corner. I remember being amused by the outside seating of these cafés — most of the seats faced the street in a row, as if you were watching a movie in a theater. As we explored, we were disappointed to find that many shops were closed, since it was Sunday. Note to self: Don’t come to Paris on a Sunday. Next up, we visited Champs-Élysées. This street is filled with lots of shops and restaurants, and is a popular tourist attraction. We walked around and popped into shops here and there. We ended our time at Champs-Élysées with a trip to the famous Ladurée for macarons and rosé. After devouring our sweets, we noticed that the lady at the table next to ours was enjoying a strawberry shortcake of some sort — and you better believe we ordered one of those too. This was our only dinner in Paris, since we planned to leave the day after, so we knew we had to make it good. We enjoyed a lovely meal at La Comète, accompanied by great conversation, as after the night, we’d be returning to our study abroad program at the University of Sussex. Because today was our final day in Paris, we headed out early in the morning to fulfill both of my needs — that is, my needs for caffeine and picturesque places. Rue Crémieux is one of the cutest streets I saw during my trip. A single block tucked in the middle of a busy street, Rue Crémieux consists of many pastel-colored houses. After walking through the block and admiring each of these homes, we hopped on a bus and headed over to Teléscope, a coffee shop that I came across online. Although I’d been in Paris for almost 48 hours, I had yet to have a solid cup of coffee. Although small, Teléscope didn’t hold back with its brew or its food. I ordered an almond milk latte and homemade tartine with butter and confiture, a type of fruit preserve. I originally thought this was such a weird combo — why not just have toast with butter or toast with jam? But let me tell you one thing, the French are really onto something, y’all. Usually in other cities, getting a head start is an advantage, but apparently not in Paris. After finishing up at Teléscope, we realized that nothing was open this early in Paris. With only one cup of coffee in my system, I was out to try another coffee shop in Paris before I left, even if that meant having another cup of coffee within an hour of my first cup that morning. We took the metro to Le Marais, another popular neighborhood in Paris, where we made a stop at La Caféothèque. This place roasts its beans on-site, so I already knew the coffee was going to be phenomenal. I ordered a refreshing shakerato — espresso served with ice cubes — and a bag of its daily coffee beans to bring back to the states in order to continue with my coffee tour of Europe. 2:00 p.m. — Snail ya later! With our flight back to London nearing, there was still a lot that we wanted to get done. We decided to check out Montmartre, home of Sacré-Cœur Basilica. After roaming through the streets of Montmartre and paying the Sacré-Cœur a little visit, we ended up returning to Rue Montorgueil for our final meal at L’Escargot Montorgueil. As this was the first time trying escargot, I didn’t know what to expect. Although the flavor was phenomenal, I couldn’t get over the texture of the escargot. As a vegetarian, I wasn’t used to the texture of the snails. Swinging by our hotel to pick up our bags, we made our way to the airport to catch our flight back to London. Because I only packed a carry-on bag, I wouldn’t be able to bring back wine, but lucky for me, I ended up picking up a couple bottles from the duty-free section so I was able take a little piece of Paris back with me. Was Paris all I ever imagined it would be? Honestly, it was even more. Nothing will beat traveling to the country of the language I had been studying. Although I’d had a fun couple days off from school, it was time to go back to reality and start the second session of physics at the University of Sussex. Contact Allison Fong at [email protected].